A recent patent published by McAfee describes what amounts to an anti-piracy system. Titled "Detect and prevent illegal consumption of content on the internet", McAfee's approach would employ a centralized blocklist-style system to issue warnings for -- or entirely block -- links leading to content of questionable legal standing. The most basic underpinnings of the system sound similar to Google's Safe Browsing API or Microsoft's SmartScreen, but with a laser-like focus on pirated materials instead of phishing and malware. Such a system might be an ideal addition to McAfee's existing SiteAdvisor tool. McAfee claims there are numerous reasons consumers and businesses might wish to block pirated material. Most notably, the security firm cited oft-expensive lawsuits which may arise from accessing illegal content. Additionally, unauthorized content like cracked software and key generators often serve as vessels for malware authors to distribute their handiwork. Such illegitimate files could pose a threat to both privacy and security. 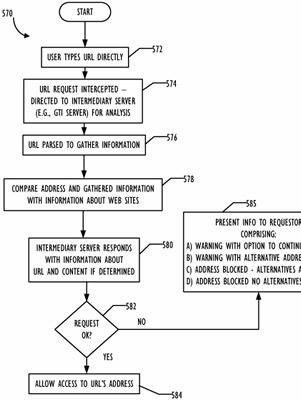 The patent does not go into great detail about the methods used to determine whether or not content is illegal; however, it does describe a system in which URLs, web-crawling data and file names could be parsed to develop contextual analysis and identify content. There is also a mention of a crowd-sourcing feature which would encourage users to provide additional information about websites to McAfee. When a user runs into copyright-infringing links, one of the system's most interesting features may be its proposed ability to present or redirect users to legal alternatives. "By informing a user of illegal sources and possible alternatives," McAfee explains, "a user can obtain the desired electronic distribution without violating an author’s intellectual property rights". Although the filing does not mention monetization, referral links to authorized distributors sounds like a simple way to monetize this feature.